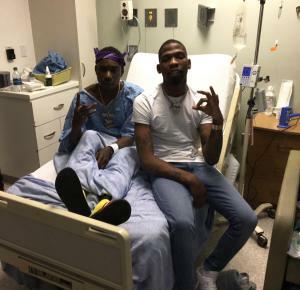 Rapper shot and hospitalized amidst peace rallies, second assassination attempt on him in less than 5 months. 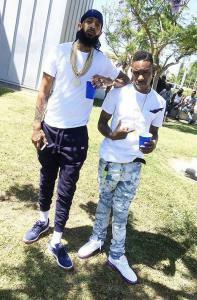 LOS ANGELES, CALIFORNIA, UNITED STATES OF AMERICA , April 10, 2019 /EINPresswire.com/ — On April 7th, just 7 days following the murder of rapper Nipsey Hussle, his close friend and fellow Los Angeles rapper Lil One Hunnet was shot in the projects he grew up in on Grape Street in Watts at the same time. He is currently hospitalized in South Central Los Angeles. Last year, Lil One Hunnet released the popular singles “We Bangin Grape “ featuring BlocBoy JB and 03 Greedo, as well as “Ridin in My Benzo” and a number of other popular singles that had amassed a viral audience. This is the second assassination attempt in less than 5 months on the young artist, who credits God for being alive, “twice in the past 5 months, these experiences have brought me closer to God. I saw the whole tunnel and bright light that people all talk about, the out of body experience”. 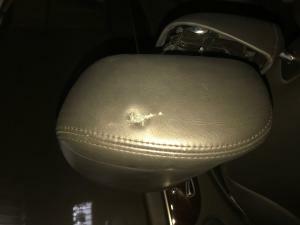 His friend was shot in the head and also survived, while One Hunnet was shot a hairline away from his spine on his neck and less than an inch from his head on the headseat as pictured. This shooting comes as a shock and devastation in a community that has always been torn and separated by coup d'état assassinations and gun violence. One Hunnet’s shooting and assassination attempts are taking place ironically despite recent massive neighborhood rallies for peace in South Central Los Angeles. His shooting is considered to be a major blow in the midst of gang factions calling for peace between the city’s gang population. One Hunnet is from the Watts projects known as the Jordan Downs (the neighborhood is most famously known as the projects shown in Menace 2 Society) which houses the Grape Street Crips most famously homaged in Rockstar Game’s Grand Theft Auto. The set has historically been at odds with their rival neighbors The Nickerson Gardens Bounty Hunter Bloods for quite some time. It wasn’t always that way though, ironically in the early 1990’s following the Rodney King verdict; the Grape Street’s and Bounty Hunter’s were two of the first to commit to the Gang Truce. But as a new generation came to be, the Truce came to an end. While Nipsey Hussle was working with both crips and bloods, and pushing for peace in the community many are dumbfounded by his assassination and the internet and community alike are overflowing with reasoning, answers and conspiracy theories. Are rappers with influence being targeted? Is the neutralization of the black community in South Central Los Angeles still orchestrated by our very own government intelligence agencies? The internet and community alike both feel that it is all too coincidental that both Nipsey and Lil One, who formed a bond, were both shot 7 days apart from one another at roughly the same time. One Hunnet issued a statement from the hospital, "This is unfortunate and I do feel that the timing is inappropriate. With Nips’ passing the community peace treaties seemed imminent and hopeful for a minute, so I am surprised I’m getting shot at this time. I really want what Nipsey and everyone else wants for this hood and city. I want the same for Watts and the city of Los Angeles. Anyone who was around in the 90's during the Peace Treaty knows that the police were derailing that by dressing up like gangbangers and doing drive-by's… and if they weren't, they were authorizing confidential informants to do the killings. It’s all public information now and you don’t have to be from LA’s underground anymore to know about the “neutralization” of the Black Panthers and other civil rights organizations or covert illegal mass attacks on the black community like COINTELPRO. The murders of rappers, especially those who can make a difference, doesn’t come as a surprise to me. I know it's hard to say where it's coming from and why. Sometimes we blame each other for an incident, when it might be something else behind it. Something is happening and we have to be wise to what is being done to us. While everyone says they are for peace and rallying, I’m still getting shot upside the head and cheating death every few months. The reality is we live in a war zone and it’s one of the longest wars known to man."